Postmodern hermeneutics, also called radical hermeneutics, have to a large extent grown out of postmodernist thought. It is as estimable an inheritance as it is a troublesome, for who has been accused more often than the postmodernists of propagating the interpretative frivolity expressed in the slogan “anything goes” (to which we only sometimes see appended the rigorous stipulation: if it works)? But the relation of radical hermeneutics to the text is by no means free, quite the contrary – to complete the hermeneutic task with full radicalism means precisely to keep “close to the text.” The problem is that both “closeness” and “text” are here understood in rather specific ways. That happens because of the “nature” of the text, the hermeneutic understanding of which was presented by Gadamer in his essay “Text and Interpretation”: “we find the hermeneutical relationship involved in our concept of text whenever we encounter resistance to our assumption of the primordial meaningfulness of the given. […] [F]rom the hermeneutical standpoint – which is the standpoint of every reader – the text is a mere intermediate product [Zwischenprodukt], a phase in the event of understanding […].” There are at least three conclusions to draw from this: firstly, “meaning” is that, around which the hermeneutical reading of the text is focused; secondly, this “meaning” is something unclear at first, something that only needs to be made present in the process of understanding; thirdly and finally, the text appears only as an epiphenomenon, fulfilling a subordinate function in this process of presence. But how does this process take place? That in fact is revealed to be an ambiguous question, based on Gadamerian hermeneutics itself. And thus on the one hand we see a concentration of meaning, while on the other, quite the contrary – its constant dispersal. It seems that the oscillation of Gadamerian hermeneutics around these two poles of understanding is a direct result of the position of the reader who desires to understand, but also wants to do justice to the text itself. Hence Gadamer’s opposition to method – to want to understand the text is to perceive its individuality, its singularity, how it eludes methods, which can, to be sure, help in understanding by shedding light on it from one angle or another, but which should under no circumstances be blindly applied to it. For what hermeneutic play with the text is about is its otherness, as a condition for the possibility of accomplishing a rearrangement of the reader’s existence: “We cannot understand without wanting to understand, that is, without wanting to let something be said”, “It is not only the impact of a ‘This means you!’ that is disclosed in a joyous and frightening shock; it also says to us: ‘You must change your life!’”. Can we not, however, after tracing this collision course between the thought of Derrida and that of Gadamer, look at the whole problem again from a somewhat different angle? Is it not possible to say that some deconstructive “element” fits into the very centre of the hermeneutic experience? Is that not what Richard E. Palmer, member of the group known as Spanos devoted to developing a postmodernist literary hermeneutics based on Heideggerian thought, has in mind when he states that “[t]o focus purely on the positivity of what a text explicitly says is to do an injustice to the hermeneutical task,” while “[q]ueasiness about ‘doing violence to the text’ must not become an excuse for turning away from the hermeneutical task of hearing deeply into the ‘what’ behind the explicitness of the text”? Does not Ricoeur lean toward the deconstructive pole when he directly says that “writing, and above all the structure of the work, modify reference to the point of rendering it entirely problematic,” that with respect to understanding, “appropriation is the dialectical counterpart of distanciation,” and that “everything gained from the critique of the illusions of the subject must be integrated into hermeneutics”? Is it, finally, possible, outside the explicitness of the text, to show several fundamental affinities of Derridean and Gadamerian thought? Let us try to define them. It appears possible to discover in Derrida a peculiar repetition (which would at the same time be a repetition with a displacement, an iteration) of the schema of dialogue between text and reader as a constant exchange of questions and answers. Derrida of course rewrites it in his own language, speaking of the “signature” of author and text and the reader’s “counter-signature”, which amends it. In both cases, however, we are dealing with a similar ontology of the literary work, which only exists (i.e., becomes actualized) in the process of interpretation. And though this actualization takes place in various ways (more as an “ecumenical” dialogue for Gadamer, more as an “agonistic” exchange for Derrida), we might risk cautiously positing the thesis that next to the hermeneutic circle it would be possible to speak of a specific (“dislocated,” because deprived of its overall dimension) deconstructive circle, where the point is likewise a kind of answer to the challenge of the text: “I almost always write in response to solicitations or provocations,” but “my response to such expectations is not always docile.” In this “provocation” we must hear a pro-vocatio, a challenge directed to none other than ourselves, calling to impart a creative answer, to amend the idiom of the text with our own idiomatic signature. As is known, Derrida speaks in such cases of invention, but do we not find him here – still – very close to Gadamer, for whom “all efforts at trying to understand something begin” with what “is strange, challenging, disorienting”? We should also stress once again the ambivalence of the Gadamerian text, which, though it sets before the interpreter the task of reconstructing and integrating the meaning of the literary work, simultaneously never asserts that such unification is unproblematic. On the contrary, it is incumbent upon us to ponder whether, in the context of Gadamer’s hermeneutics, such unification can ever in fact take place. Gadamer himself speaks just as often instead about the “surplus” of meaning, of “being struck by the meaning of what is said,” which destroys any “anticipation of meaning.” And once again: is it not possible to hear in this a kind of equivalent to Derridean “excess of signifiants” that undermines any kind of procedures whose goal is to protect the play of meanings? If we answer that question affirmatively, then in Derrida’s concept of the “trace” we would have to also see a radicalization of modern hermeneutics’ theses (Gadamer’s, but also Mikhail Bakhtin’s) of the dialogical understanding. In both places, we are told that any kind of understanding takes place in a community – in a community of people and signs whose mutual exchange has no end. The lesson that postmodern hermeneutics draws from deconstruction thus involves, above all, paying closer attention to the textuality (the sign-ness) of the text. Though that aspect was perceived by certain currents in modern hermeneutics (particularly by Ricoeur), it is simply absent, as Wojciech Kalaga, among others, observes, from Heidgger’s and Gadamer’s conceptions. 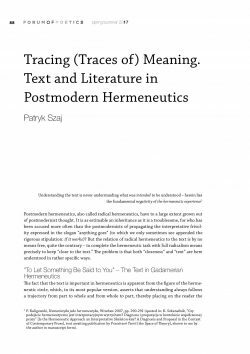 Postmodern hermeneutics attempts to compensate for that semiotic deficit; one of its representative projects is Hugh J. Silverman’s hermeneutic semiology, issuing from his belief that the text constitutes a phenomenon operating at the intersection of semiotics and hermeneutics, in connection with which “[a]s the reading identifies the textuality of the literary work, the reading deconstructs the text such that, on the one hand, the signs actualize the signification, and, on the other hand, the signification actualizes a meaning through interpretation.” This process of actualization turns out, however, to be unfinished, since textuality is not only a kind of “practice of the text” but also a “condition of the text” that determines its “trace” quality, resulting from connections with other texts and other signs. Caputo also draws attention to a similar aspect of textuality; his hermeneutics also “opens up” to the logic of différance – it is that logic that determines the “trace” quality of the text and its “impure” nature. Because if every sign carries in itself a kind of “reminiscence” of preceding signs, and simultaneously somehow “anticipates” the signs that will succeed it, then to its stable identity breaks down. That is why Dybel is right in asserting that “every signifier is only itself to the extent that it is outside itself.” Literature, according to Caputo, represents the “exemplar” of such contamination. All of this does not signify, however, whether for Caputo, or for Silverman, or for Derrida himself, a cessation of any kind of hermeneutic efforts whatsoever. On the contrary, it could be said that such efforts must be additionally reinforced, precisely in order to carry the process of decoding to the furthest lengths possible. Those “furthest lengths possible” indicate that in the text itself are located elements which in a certain sense protect it “from any assured horizon of a hermeneutic question,” and even cause the hermeneut to be “provoked and disconcerted,” so that interpretation takes place in a “radical field of possible understanding,” beyond which there is no way of going, if faithfulness to the text is to be preserved. “To carry the process of decoding… to the furthest lengths possible” thus means to have an awareness that the logic of différance is by no means the culmination of hermeneutic procedures, but on the contrary, is what forces them to proceed while simultaneously rendering impossible their completion: understanding is revealed to be an infinite process, if only it takes into consideration the “coefficient of indefinition” that accompanies différance. Is Michał Januszkiewicz then in the right when he asserts that the postmodern radicalization of hermeneutics takes place under the banner of the reader’s intention? It seems that the matter is not that simple, or even that it is marked by a fundamental undecidability. On the one hand, the radical-hermeneutic reader must be characterized by inventiveness, must respond to the text creatively, and that means essentially bringing his or her own perspective into the text. On the other hand, though, as we have seen above, that text says “something” to the reader, and in some sense “imposes” respect for its complicated textual games, not allowing total interpretative freedom, but also “blocking” interpretations that oversimplify its meaning, and seeking to pass for coherent, unifying and adequate. A radical hermeneutic interpretation thus does not present itself as either legitimate or constructivist – as Norbert Leśniewski has observed, its place is somewhere in between these two poles, in fact transcending both of them. Why is this so? Let us see what a closer examination of the matter has to tell us. The radical hermeneutic ontology of the text is of course a “weak” ontology (in Vattimo’s sense of the term): it does not ask what the text-in-itself is, but rather what happens in the text, what the text is as an event, as a specific phenomenon given only in the experience of reading. It thus treats it as something endless, i.e., semantically and structurally open, susceptible to recontextualization. Any literary work can, from the radical hermeneutic perspective, be identified with a “silva rerum” – a text exposed to the possibility of further development and structuring by the reader, a peculiar kind, as Ryszard Nycz says, of “musical score waiting for a readerly ‘performance.’” To the extent, however, that the silva rerum constitutes a certain “exemplary” model of a radical hermeneutical text, a manifestation of contemporary literature’s “higher hermeneutic consciousness” (particularly since Nycz himself notes that the subject of silvas in a sense moves about in a “hermeneutic ring”), it only brings into high relief qualities that are immanently proper to all texts. That is because the text is grasped in postmodern hermeneutics not so much as an ergon (a work in the classical sense) but rather as an energeia – an operation with a distinct performative aspect. Such an approach is also in fact present in modern hermeneutics, as mentioned by Januszkiewicz or – implicitly – by Katarzyna Rosner, who claims that “the text’s meaning is not something already prepared, sealed in the text and requiring recognition. The text’s meaning arises in the course of interpretation, through its assimilation, i.e. the relation of the communication contained within it to our existential situation, endowing it with referentiality to our world. Only through assimilation […] does the text speak to us, conveying its truth to us.” Postmodern hermeneutics maintains this view, but simultaneously weakens its “truth” claims, treating such questions as “assimilation,” “communication contained within it,” and “referentiality” with scepticism. It responds to Gadamerian performativity (the literary work says: this means you, you must change your life) with a purely Derridean performativity (the literary work sometimes says: there is no you – this means you!) – there is no “you,” since “you” is only constituted as an effect of reading, it is, to speak in paradox, somehow performatively stated, called into existence by the text. In short: the reader’s identity is a relational identity. The text itself, however, is revealed to be “the point of encounter of potentiality and actuality” – a mutual exchange of traces, which can lead in the most varied directions (constructivist pole), and readerly concretizations, which always somehow tailor, restrain, stabilize this meaning-generating play, giving priority to certain traces over others (legitimatizing pole). If, however, the text is grasped as a trace, or rather a concentration of traces, it should be remembered that the trace signifies, as it were, beyond any significative intention. That means – as I have indicated above – that postmodern hermeneutics truly says goodbye to the concept of the work’s intention (and, even more so, of authorial intention), but not to the concept itself of the text, though it does not treat it as substantial, but as an (energeia) effect of the play of traces that each time renews itself. So how should we understand the phrase “staying close to the text” in postmodern hermeneutics? It would be a kind of “tracing of traces,” or also – as Andrzej Zawadzki writes – “imitation [naśladowanie], walking in the trail of traces, tracking them and interpreting, them, answering them with one’s own trace.” In a word: pursuing the traces of the text and following in the traces of their meaning-generating play, while simultaneously being aware that each re-presentation is a de-presentation, that each time we can neutralize the indefinition of meaning only in a way. Because the text, as a tangle (from the Latin texere) of textual folds, layers, and tucks, conditions reading as their deconstruction, that is, unwrapping (or, as we often now hear in English, unpacking). In Derrida’s view, however, this work must remain endless, since a fold or wrinkle – le pli – is that “elementary” element in the text that makes impossible its semantic closure. A full ex-li-cation of the text’s meanings, in the sense of smoothing out all of their folds, therefore turns out to be impossible. For hermeneutics, this is naturally a source of drama. But it is also quite simply a condition for the possibility of practicing any kind of hermeneutics: if it were possible to unproblematically “unfold” all textual folds, there would be no need for hermeneutics. That is why the law of textuality should be properly kept in force. Cracks in the text therefore not only do not permit “freewheeling” interpretation, but in fact, force the reader to perform a faithful microreading: “There exists a ‘system’ and there exists the text, but in the text there are cracks and resources that cannot be controlled by the systematic discourse […]. Hence the necessity of constant, active interpretation, engaged like a scalpel in microbiology, strenuous and at the same time faithful.” One would even like to say that Derrida, in his postmodern hermeneutics, propose a particular close reading strategy, which is attentive (close) but differs from the method developed by the New Critics in not being closed but rather open to all of the contexts that those American formalists sought to eliminate. Because the text does not constitute a finite whole, but is, as Kalaga says, “‘profligate.’” In activating its energies, I must take into consideration all the analytical tools available to me, but I always perform that analytical work with consideration to myself, accenting what binds me to the text, what touches or moves me, and naturally allowing the loss of other meanings. In this sense understanding is never complete, and this results both from the finitude of the interpreter and from the “trace” structure of the sign. This radical hermeneutic faithfulness to the text would thus be a faithfulness that is… unfaithful. If for Derrida, each signifier is itself to the extent that it is beyond itself, then at the level of interpretation there is a kind of “betrayal” of the text that corresponds to that paradox: the identity of the sign as something denotative is betrayed, but is betrayed in order to be able to continue signifying, to keep from solidifying its play, and to keep from identifying with it in some kind of tautological interpretation, but rather render respect to its otherness. For that reason, Januszkiewicz can say that “creative unfaithfulness” towards the text “is in fact faithfulness par excellence,” and it results – on the one hand – from a kind of double bind (the text wants to communicate some meaning, and simultaneously can say nothing unequivocal), and, on the other – from a model of reading as a “duel of singularities,” in which the countersignature confirms and repeats the signature of the other to the same extent as it “lead[s] it off elsewhere,” iterating the “primary” text, extracting from it some kind of “truth” for itself. If, then, there is supposed to be talk here of a correspondence between text and interpretation, it is only in the sense of “a responsible response,” a corespondence, a mutual answering of each other, shared responsibility for meaning. It seems that we could go so far as to describe the relationship of radical hermeneutics with the text using the metaphor of painfulness or arduousness. That word would indicate, on the one hand, a lack of indifference in interpretation, a kind of being affected by the read text, a living relationship with the text, and on the other, the individuality of the experience of the text, the event (in the sense of unrepeatable, unique) nature of interpretation, in which the reader is existentially engaged. At the same time, it would also indicate the painful impossibility of unifying the results of an interpretation, and the painful multiplicity of the text’s meanings, which do not surrender to hermeneutic operations. This understanding of painfulness can also be found, I believe, in the work of both Gadamer and Derrida. As we remember, Gadamer described the experience of the literary text as “being struck by the meaning of what is said,” which does not lead to a harmonious concentration of meaning, but surpasses any possible horizon of expectations. In the German original, “being struck” was expressed by the word Betroffenheit, in which word we can also hear the verb treffen, meaning (among other things) to physically hit, and the passive form betroffen werden means to be hit, struck, possibly hurt. The sense of touch and the problem of the painfulness of the work of art are also evoked by the concept, drawn from Heidegger, of the “push” (Stoß) that, according to Gadamer, the reader was supposed to experience from a work that had a particularly powerful effect on him. The “push” also does not respond harmoniously to the anticipation of meaning but rather leads to a painful “rupture.” We find analogous terms in Derrida’s work, when he speaks of the experience of reading as an “ordeal” (but also, importantly, “body,” “desire”). The ordeal is painful because, as we read elsewhere, there is “no poem that does not open itself like a wound, but no poem that is not also just as wounding,” which thus would not, on the one hand, expose itself to interference by the reader, and on the other, would not interfere painfully with the reader’s world. The category of painfulness seems to have several important assets. First of all, it indicates that the hermeneutic “understanding” is not – regardless of appearances to the contrary – a purely intellectual activity, but also has a bodily dimension, and involves the participation of affects, mood, a certain “orientation” on the reader’s part. In this sense, Susan Sontag, for example, was wrong when she postulated the replacement of hermeneutics with an “erotics of art,” since understanding is very much capable of being (though not required to be) erotically oriented. The reader is a reader of flesh and blood, and his body, for good or ill, takes part in the process of interpretation, even if a particular hermeneut may not underscore the fact. Secondly, in such a perspective “staying close to the text” would mean in fact being sensitive to its painful sensations, i.e., as Andrzej Sosnowski says – allowing the text to “get into it with us,” and simultaneously allowing it to “hit where it hurts,” so that it could then mark me, leave some trace of itself in me, and so that that trace would leave a real impression, not leaving me to my own devices, making it impossible for me to neutralize it. Painfulness, understood in this way, would also operate in the other direction: if the text gets into it with me or hits me where it hurts, then – as Markowski remarks on Sosnowski’s concept – I too “in some way […] impose myself on what I am reading,” such that we can speak here of a certain “painful complicity,” of a mutual exchange between the “open… like a wound,” “wounding” text and reader who “reads and enters into the spirit” of a work and also reads himself into it. Thirdly and finally, painfulness appears to present itself as an “undecidable” category: on the one hand, it underscores the painful aspect of being struck by the text, while on the other it also points toward a certain intimacy, or even eroticism, a tenderness (in both senses of that adjective) in the relationship with the text. On the one hand, it says that the text painfully marks me, on the other, that I intervene in the text, adding to it my countersignature. Because everything happens at this intersection, at this point of encounter, in this inter-esse, this chiasmus, in this “relationship between two experiences, two occurrences or two languages involv[ing] double invagination.” And that figure of the chiasmus can in fact be seen as the radicalized (here meaning: weakened) figure of the fusion of horizons. The article discusses the approach to the text and the process of interpretation which we encounter in postmodern (radical) hermeneutics. It begins with a discussion ofthe concept of the text developed by Hans-Georg Gadamer, which is then confronted with the critique applied to hermeneutics by Jacques Derrida. After the recapitulation of both positions, an unexpected similarity is observed between the Gadamerian and Derridean teachings on the theme of the “ontology” of the literary work and the “nature” of the process of interpretation. Postmodern hermeneutics, on the one hand, perceives this similarity, while, on the other, it attempts to treat the “lesson of deconstruction” seriously, turning more watchful attention to the text’s textuality, its trace aspect, the infinite play of meanings that renders impossible the conclusion, completion, unification or fulfilment of any hermeneutic procedures. Keeping close to the text based on postmodern hermeneutics thus involves a kind of “tracing the traces” – a pursuit of the meaning-generating play of the text and additional inscription in it of the reader’s creative counter-signature. At the end of the article, the metaphor of “painfulness” or arduousness is proposed as a concept that aptly conveys the relations of radical hermeneutics with the text. P. Kuligowski, Humanistyka jako hermeneutyka, Wrocław 2007, pp. 290-291 (quoted in: K. Szkaradnik, “Czy podejście hermeneutyczne jest interpretacyjnym wytrychem? Diagnoza i propozycja w kontekście współczesnej prozy” [Is the Hermeneutic Approach an Interpretative Skeleton-key? A Diagnosis and Proposal in the Context of Contemporary Prose], text awaiting publication by Przestrzeń Teorii [the Space of Theory], shown to me by the author in manuscript form). See M. Heidegger, Bycie i czas (Being and Time), trans. B. Baran, Warszawa 2010, pp. 202-209. See H.-G. Gadamer, Prawda i metoda. Zarys hermeneutyki filozoficznej (Truth and Method. Outline of Philosophical Hermeneutics), trans. B. Baran, Warszawa 2016, pp. 493-517. P. Ricoeur, Time and Narrative, vol. 3, trans. Kathleen Blamey, Chicago 1988, pp. 321-322. H.-G. Gadamer, “Text and Interpretation,” trans. Richard E Palmer, in The Gadamer Reader: A Bouquet of the Later Writings, ed. Richard E. Palmer, Evanston 2007, p. 169. I am indebted to Katarzyna Szkaradnik for this observation. H.-G. Gadamer, “The Hermeneutics of Suspicion,” in Hermeneutics: Questions and Prospects, ed. Gary Shapiro and Alan Sica, Amherst 1984, p. 54. See H.-G. Gadamer, Truth and Method, trans. W. Glen-Doepel, revised by Joel Weinsheimer and Donald G. Marshall, London 2013, p. 164. H.-G. Gadamer, “Text and Interpretation,” p. 191. H.-G. Gadamer, Truth and Method, p. 305. H.-G. Gadamer, The Relevance of the Beautiful and Other Essays, trans. Nicholas Walker, Cambridge 1987, p. 33. See P. Dybel, Oblicza hermeneutyki (Faces of Hermeneutics), Kraków 2012, p. 340. H.-G. Gadamer, “Language and Understanding,” in Theory, Culture & Society 23(1), 1970, p. 14. H.-G. Gadamer, “Aesthetics and Hermeneutics,” trans. David E. Linge, in The Gadamer Reader, pp. 129, 131. See A. Burzyńska, “Jak czytali dekonstrukcjoniści” (How the Deconstructionists Read), in Anty-teoria literatury (Anti-theory of Literature), Kraków 2006, p. 275. On the subject of Derrida and Gadamer’s meeting in Paris, see e.g. K. Bartoszyński, “Hermeneutyka a dekonstrukcja. Hans-Georg Gadamer i Jacques Derrida wobec poezji” (Hermeneutics and Deconstructon. Hans-Georg Gadamer and Jacques Derrida on Poetry), in Kryzys czy trwanie powieści. Studia literaturoznawcze (Crisis or Continuation of the Narrative. Literary Studies), Kraków 2004; P. Dybel, “Poza dialektyką? Spór Gadamera z Derridą” (Beyond Dialectics? Gadamer’s Dispute with Derrida), in Granice rozumienia i interpretacji. O hermeneutyce Hansa-Georga Gadamera (Boundaries of Understanding and Interpretation. On the Hermeneutics of Hans-Georg Gadamer), Kraków 2004; P. Dehnel, “Dekonstrukcja a hermeneutyka” (Deconstruction and Hermeneutics), in Dekonstrukcja – rozumienie – interpretacja. Studia z filozofii współczesnej i nie tylko (Deconstruction, Understanding, Interpretation. Studies in Contemporary Philosophy and Much More), Kraków 2006. See P. Dybel, Oblicza hermeneutyki…, pp. 120-127. J. Derrida, Of Grammatology, trans. Gayatri Chakravorty Spivak, Baltimore 1997, p. 14. J. Derrida, Positions, trans. Alan Bass, Chicago 1982, p. 45. See J. Derrida, “Structure, Sign and Play in the Discourse of the Human Sciences,” in The Languages of Criticism and the Sciences of Man: The Structuralist Controversy, eds. Richard Macksey and Eugenio Donato, Baltimore 1970, pp. 247-265. This has been very strongly underscored by such interpreters of Derrida as Christopher Norris (“Deconstruction is therefore an activity of reading which remains closely tied to the texts it interrogates” – Deconstruction and Practice, London and New York 1993, p. 31) or John D. Caputo (see Deconstruction in a Nutshell. A Conversation with Jacques Derrida, New York 1997, pp. 74-81). Aleksander Nawarecki also treated Derrida as one of the “patrons” of his project of micrology (see Miniatura i mikrologia literacka [Literary Miniature and Micrology], vols. 1-2, ed. A. Nawarecki, Katowice 2000-2001). “‘This Strange Institution Called Literature’: An Interview with Jacques Derrida,” in Acts of Literature, ed. Derek Attridge, New York 1992, pp. 61-62. See P. de Man, Allegories of Reading: Figural Language in Rousseau, Nietzsche, Rilke, and Proust, New Haven 1979, pp. 300-301. “‘This Strange Institution,’” p. 45. J. Derrida, Limited Inc., trans. S. Weber, J. Mehlman, Evanston 1988, p. 148. See J. Derrida, Spurs, p. 133. On this topic, see e.g.. N. Leśniewski, O hermeneutyce radykalnej (On Radical Hermeneutics), Poznań 1998, pp. 35-40. P. Ricoeur, “The Hermeneutic Function of Distanciation,” trans. John E. Thompson, in Hermeneutics and the Human Sciences: Essays on Language, Action and Interpretation, Cambridge 1981, pp. 141, 94, 191. See also my article: “Czy można pogodzić dekonstrukcję z hermeneutyką? Dialog Derridy z Gadamerem” (Can Deconstruction be Reconciled with Hermeneutics? Derrida’s Dialogue with Gadamer), Czas Kultury 2014, no. 5. “This Strange Institution,” p. 41. See e.g. J. Derrida, Psyche. Inventions of the Other, trans. Peggy Kamuf and Elizabeth Rottenberg, Stanford 2007. See H.-G. Gadamer, “Language and Understanding,” in The Gadamer Reader, p. 129. See J.D. Caputo, More Radical Hermeneutics: On Not Knowing Who We Are, Bloomington and Indianapolis 2000, p. 53. Ibid., p. 50. Dybel also writes about the dissimilarity between Derrida and Gadamer’s ontologies of the workof art, noting that it results from their operating in different orders: that of the signifier (the “trace” of which Derrida writes) and the signified (the “Thing” that Gadamer talks about) (see P. Dybel, Granice rozumienia…, pp. 457-463). See J.D. Caputo, Radical Hermeneutics. Repetition, Deconstruction, and the Hermeneutic Project, Bloomington and Indianapolis 1987, p. 97. See D. Hoy, “Jacques Derrida,” in The Return of Grand Theory in the Human Sciences., ed. Q. Skinner, Cambridge 1985, pp. 41-64. See M.P. Markowski, “Od rozumienia do nierozumienia” (From Understanding to Misunderstanding), in Polityka wrażliwości. Wprowadzenie do humanistyki (Politics of Sensitivity. Introduction to the Humanities), Kraków 2013, p. 233. W. Kalaga, Mgławice dyskursu. Podmiot, tekst, interpretacja (Nebulae of Discourse. Subject, Text, Interpretation), Kraków 2001, p. 49: “ […] the absence in the conceptual apparatus of hermeneutics of a coherent and methodologically active category of the sign. Hermeneutics concentrates on problems of interpretation, at the same time not devoting much attention to the most important constitutive factor and medium of interpretative processes; it studies mechanisms of interpretation, overlooking the machinery that lies at its foundations”( see also the entire chapter on interpretation and ontology, in which the author conducts a curious postmodern attempt, complementing hermeneutics, at joining the positions of hermeneutics and semiotics toward the problem of interpretation). H.J. Silverman, Textualities. Between Hermeneutics and Deconstruction, New York and London 1994, p. 73. See also N. Leśniewski (translator of Silverman into Polish)’s discussion of Silverman’s concept in “O tekstualności. Hermeneutyka semiologiczna Hugh J. Silvermana” (On Textuality. Hugh J. Silverman’s Semiological Hermeneutics), in O hermeneutyce radykalnej…). See J.D. Caputo, Radical Hermeneutics…, p. 6. P. Dybel, Oblicza hermeneutyki…, p. 42. See J.D. Caputo, Prayers and Tears of Jacques Derrida. Religion without Religion, Bloomington and Indianapolis 1997, p. 52. See J. Derrida, Spurs, pp. 127, 133. N. Leśniewski’s term, O hermeneutyce radykalnej…, p. 225. See M. Januszkiewicz, W-koło hermeneutyki literackiej (In the Literary Hermeneutic Circle), Warszawa 2007, pp. 19-21. See N. Leśniewski, O hermeneutyce radykalnej…, pp. 48-57 (though it is possible to observe that this Poznań scholar perpetuates the error of many interpreters who accuse Derrida of interpretative indulgence). See R. Nycz, “Współczesne sylwy wobec literackości” (Contemporary Silvas and Literariness), in Problemy teorii literatury. Seria 3 (Problems of Literary Theory. Series 3), ed. H. Markiewicz, Wrocław 1988, pp. 292, 283. See M. Januszkiewicz, W-koło hermeneutyki literackiej…, p. 60. K. Rosner, “Hermeneutyczny model obcowania z tekstem literackim” (The Hermeneutic Model of Contact with the Literary Text), in Problemy teorii literatury. Seria 4 (Problems of Literary Theory. Series 4) ed. H. Markiewicz, Wrocław 1998, p. 300. We could also here again cite Richard E. Palmer, whose above-quoted “Hermeneutical Manifesto to American Literary Interpretation” argues that meaning is not an objective, eternal idea, but something that appears in a mutual relation (R. Palmer, Hermeneutics…, pp. 223-254). See J.D. Caputo, More Radical Hermeneutics…, p. 55. W. Kalaga, Mgławice dyskursu…, p. 227. The phenomenological language is not irrelevant here: Derrida’s thought grows out of the phenomenological tradition, which perhaps revals itself most clearly in his convictions concerning the process of interpretation of the literary text. In his conversation with Derek Attridge, he said: “I believe this phenomenological-type language to be necessary, even if at a certain point it must yield to what, in the situation of writing or reading […] puts phenomenology in crisis” (“This Strange Institution,” pp. 44-45). A. Zawadzki, Literatura a myśl słaba (Literature and Weak Thought), Kraków 2009, p. 157. See N. Leśniewski, O hermeneutyce radykalnej…, p. 201, 203. See J.D. Caputo, Deconstruction in a Nutshell…, p. 88. See M.P. Markowski’s reaosning on the topic of the fold/wrinkle/crease (le pli) in his Efekt inskrypcji. Jacques Derrida i literatura (The Inscription Effect. Jacques Derrida and Literature), Bydgoszcz 1997, pp. 261-267. Interview of Christian Descamps with Derrida in Le Monde, reprinted in Entretiens avec Le Monde: Philosophies, Paris 1984, pp. 78-90. For discussion of this topic, see A. Burzyńską, “Lekturografia. Derridowska filozofia czytania” (Lecturography. Derrida’s Philosophy of Reading), in Anty-teoria literatury…. W. Kalaga, Mgławice dyskursu…, p. 222. See M. Januszkiewicz, “Hermeneutyka jako miejsce spotkania filozofii i literatury” (Hermeneutics as a Point of Encounter of Literature and Philosophy), in Kim jestem ja, kim jesteś ty? Etyka, tożsamość, rozumienie (Who Am I, Who Are You? Ethics, Identity, Understanding), Poznań 2012, p. 83. “This Strange Institution,” p. 69. See also D. Attridge, “Reading and Responding,” in The Singularity of Literature, New York 2017. 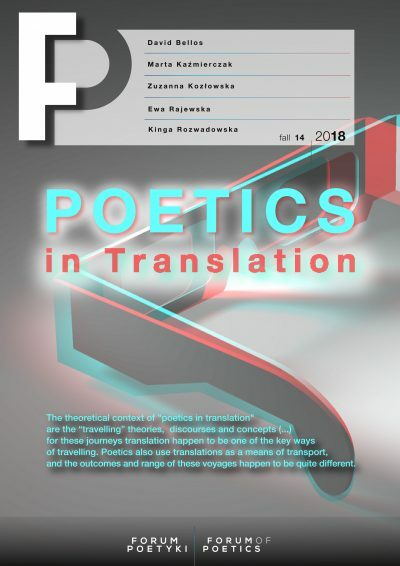 See my article “Dotkliwe wiersze Aleksandra Wata” (Aleksander Wat’s Painful Poems), which constitutes an attempt to use the category of “painfulness” in interpretative practice (the article is being prepared for publication in Pamiętnik Literacki, and will be published in a forthcoming issue of the magazine. The term comes from Gadamer’s text Und dennoch: Macht des guten Willens (quoted in: P. Dehnel, Dekonstrukcja a hermeneutyka…, p. 88). “This Strange Institution,” p. 50. J. Derrida, “Che cos’è la poesia?”, trans. Peggy Kamuf, in A Derrida Reader: Between the Blinds, New York 1991, p. 233. S. Sontag, Against Interpretation and Other Essays, New York 1967, p. 14. For similar reasons, I find Izabella Bukraba-Rylska’s diagnosis that in contemporary humanities a shift has been made from “hermeneutic ‘understanding’ to somatic ‘experience’” to be inapt, since understanding itself is already a “somatic experience” (see I. Bukraba-Rylska, “Humanistyka współczesna. Od hermeneutycznego ‘rozumienia’ do somatycznego ‘doświadczenia’” (Contemporary Humanities. From Hermeneutic “Understanding” to Somatic “Experience”), Kultura Współczesna 2015, no. 2). See A. Sosnowski, Ostatnia miłość literatury (Literature’s Last Love), Literatura na Świecie 1998, pp. 11-12. M.P. Markowski, Od rozumienia do nierozumienia…, pp. 260-261. I refer here to M. Januszkiewicz’s proposal (“Wczytywanie (się) w tekst. O interpretacji transakcyjnej” [Reading [and Entering into] the Text. On Transactional Interpretation] in Kim jestem ja, kim jesteś ty?…), according to which interpretation is always a certain kind of transaction: reading and entering into the spirit of a text (i.e. of what the text is saying), we simultaneously bring the text into ourselves (meaning I enter into the world of the text with the baggage of my own prejudices, experiences, worldviews, etc. which shape and form my interpretation). J. Derrida, Parages, Paris 1986, p. 196 (quoted in: M.P. Markowski, Efekt inskrypcji…, p. 368; see also the interpretation of the figure of the chiasm which Markowski performs in the chapter of that book entitled “Chiazm”).